Do you know Diwali is not only celebrated in India but in many parts of the world? The vigor and passion about the festival is same everywhere. People follow various customs and traditions that are exclusive to the festival. No stone is left unturned to have the best Diwali celebration. Browse to learn about the places that celebrate this festival of light and how they successfully add grandeur to this sparkling festival. Find out more about the festival and find how these places around the world observe this festival of light. And if this article helped to the places of celebration, you can click here to refer this page to your friends and surprise them. 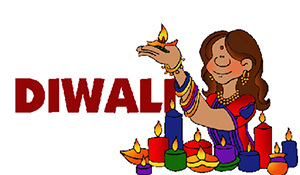 Diwali which is a pan India festival is celebrated in almost all parts of India with equal zeal and vigor. Almost every Hindu participates in the celebration and helps to make this festival take a shape of grandeur. This festival takes such a grandeur celebration that the festival no more remain confined to the land of India only. The festival of Diwali is celebrated worldwide now. However the passion and zeal in the celebration is no less from the people who celebrates this festival in India. One must be wondering as to why this festival is given such a preference over the rest of other Hindu festivals? Well the reason being for the festival of Diwali us considered as the one that signifies the victory of good over the evil. Thus in order to drive all evils away the festival of Diwali is observed for it is believed that the evil spirits are destroyed into ashes by the fireworks. Thus in order to celebrate this festival, many kinds of jubilations and feasts take place all around the world. The Hindus in Guyana, Fiji, Mauritius, Myanmar, Malaysia, Nepal, Japan, Thailand, Srilanka, Trinidad and Tobago as well as Britain, Indonesia, Singapore, Africa, Australia and even Southern America are known to celebrate Diwali thus they leave no stone unturned to celebrate this festival at its utmost. In India the festival of Diwali is celebrated over five days. The celebration in India mainly comprises of displaying of multi-colored Rangoli designs at the entranceway of residents, arranging for special puja ceremonies, decorating houses with colorful and sparkling lights and earthen lamps (diyas), exchange of sweets and gifts, fireworks and lots of shopping. Every home in the country thus shines with the glow of the dazzling lights and candles that are lit to welcome Goddess Lakshmi on the auspicious occasion. The celebration observed is no less in vigor then seen in India, for the people in Britain make sure they clean themselves as well their homes so as to provide a feeling of piousness and austerity. People out there wear new clothes and decorate their homes with fancy decorative lights to celebrate the occasion. The British city of Leicester is however notably famous for the Diwali extravaganza. The official switch-on ceremony is the highlight of Diwali celebrations in Leicester. Thousands of people gather in order to witness the ceremony. However Diwali celebrations in USA are quite alike to that witnessed in India, for in USA, houses are decorated with earthen lamps just like that of their Indian counterparts. Spectacular display of sparkling electronic lights is the highlight of the celebrations. Colorful rangoli are also displayed at the entranceway of every household. People in USA thus make sure that by the evening time, they gather at the community hall nearby where various cultural events are organized. Along with the events various fire crackers are burst and Diwali sweets and snacks are distributed among the gathered members. Exchanging of gifts also prove as a dominant ritual. Australia has an estimated population of 100,000 Indians settled there, with the majority of them being Hindus. Thus it is quite evident that the festival of Diwali will quite be a major festival in the country with large scale of Diwali events, like carnivals and fairs, organized in cities such as Sydney and Melbourne. The events that are mainly featured are fireworks display, food stalls offering Diwali sweets and delicacies, musical performances and also burning the effigy of Ravana. Auckland and Wellington sees the maximum funfair of Diwali celebrations in New Zealand, as the Asia New Zealand Foundation oversees it. These places also have the maximum concentration of Hindus. Celebrations are always on the weekends following the event. The programmes are marked with Indian performers and artists flown from India, and performances ranges from sand sculptures to classical dances to puppet shows. As per census about 63% population in Mauritius has Indian origins 80% of which are Hindus. Therefore, the celebration of Hindu festivals is a common sight in the land of Mauritius and the festival of Diwali serves as the prime of them. The festival of Diwali is thus celebrated to commemorate the return of Lord Rama, after 14 years of exile. Much like India, earthen lamps are lit in rows, in Mauritius. Goddess Lakshmi is worshipped and crackers are burst to ward off the evil spirits. The festival of Diwali is known as 'Tihar' in Nepal and is thus celebrated for five days, in the month of October/November. On the first day of the celebrations, cows are worshipped and given offerings. On the second day, dogs are revered and offered special food. The third day celebration of Diwali in Nepal is quite similar to that in India, for the festival is celebrated with lights, lamps and social activities. On the fourth day of celebration, Yama, the Lord of Death, is worshipped and appeased. Whereas on the fifth and final day of the celebration, brothers and sisters meet and exchange gifts. Thus the customs and traditions observed in Nepal are quite dissimilar with that of India. Despite having only about 8% of its population belonging to Hindu community, Diwali is still serves as an important festival in Malaysia. The community celebrates the festival as a symbol of triumph of good over evil. Known as Hari Diwali, it is a public holiday in the country. The traditional ritual of oil bath begins the festival which includes prayers at household altars and visit to temples. Temples are adorned with flowers and oil lamps while parades and concerts are organized in some of the major cities. However Malaysia has strictly banned the bursting of fire crackers in this country. The name Indonesia is derived from two Greek words: "Indos" meaning Indian and "Nesos" meaning islands. Thus it has well knitted connection with India and the Indians. Though the majority of Indonesia population follows Islam, however Hindus constituent about 2% of Indonesia's total population. Thus that does not mean that the land lags behind in the celebration of Diwali for it is celebrated with much pomp and gaiety. The island of Bali is mainly famous for the celebrations of Diwali, as the majority of the Indians are concentrated there. They celebrate the festival by following rituals that are native to India. The celebrations in the country are hence similar to that of India. Diwali celebrations in Trinidad are marked by the colorful display of fireworks. Since 1966, the festival is celebrated for nine days and culminated with a national holiday. Indian classical music performances, Hindu devotional song renditions, dance shows are organized during the festival. People clad themselves in ethnic Indian attire, to take part in the merrymaking. Singapore is largely inhabited by wide number of Indian people. And Serangoon Road in Singapore is famous for Diwali its celebrations. This is the place where maximum people of Indian origin reside. During Diwali, the streets in Singapore are filled with families, who are busy shopping for the festival. The archways are decorated with flowers and garlands. Diyas are also lit. People visit Hindu temples in Singapore to offer prayers. The customs of celebration is no different for the people of Fiji for Indo Fijian community just like the Indian community decorate their homes with flashing lights. Apart from Hindus in the island nation, non-Hindus also take part in the festivities. Apart from bursting crackers, children also actively take part in various extracurricular activities held in their schools. Various sweets and fireworks are exchanged amongst each other which mark as a sign of merrymaking. The diyas, candles and electric lights are lit in the evening. The celebrations are culminated by feasting.